Developmental changes in cognitive abilities in childhood have long been of interest to researchers across many fields, including behavioral sciences, communications, education, and medicine. With the publication of research findings showing individual differences in the development of children's learning skills has come the realization that models, methodologies, and analysis approaches that include consideration of individual differences are needed. It has brought an increase in research collaborations among experts in different fields who bring different approaches together in studies of cognitive abilities. 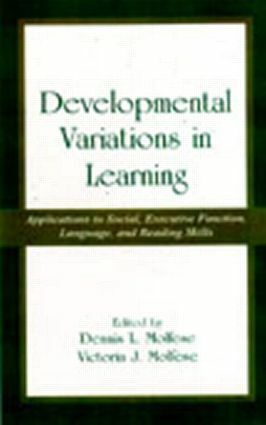 This work has yielded a growing body of knowledge about how children with normal abilities and those with developmental disorders learn, gain skills in social competency, develop decision making and planning abilities, and acquire language skills and the skills needed for reading and writing. More recently, researchers have sought to use this body of knowledge as a basis for the early identification of children at risk for cognitive delays and for the development and evaluation of intervention approaches. The chapters in this book review literature in five areas of cognition, and provide theory- and research-based information on the applications of research findings and intervention approaches. Throughout the chapters, information on the interactions of different cognitive abilities and the role of individual differences in development that influences development assessments is included. "…the Molfese's have gathered together a small, but influential set of research reviews into a quite accessible volume, which provides a nice summary of the current state of developmental/cognitive science….The strength of this book is its emphasis on the variety of areas of cognitive development that directly impact current concerns in pediatric neuropsychology and school psychology….serves as a useful set of reviews for the clinician looking to better understand the need to consider individual variation in cognitive and social development, and for the researcher seeking an up-to-date account of methods available for addressing this issue." Contents: Preface. V.J. Molfese, T.B. Martin, Intelligence and Achievement: Measurement and Prediction of Developmental Variations. J.M. Holahan, B.A. Shaywitz, V. Chhabra, A. Shneider, K. Marchione, S.E. Shaywitz, J. Fletcher, Developmental Trends in Teacher Perceptions of Student Cognitive and Behavioral Status as Measured by the Multigrade Inventory for Teachers: Evidence From a Longitudinal Study. L. Waterhouse, Social Interaction Impairments. S.H. Landry, C.L. Miller-Loncar, K.E. Smith, Individual Difference in the Development of Social Communication Competency in Very Low Birthweight Children. K.A. Espy, P.M. Kaufmann, Individual Differences in the Development of Executive Function in Children: Lessons From the Delayed Response and A-not-B Tasks. M.C. Welsh, Developmental and Clinical Variations in Executive Functions. D.L. Molfese, D.B. Narter, A. Modglin, The Relation Between Language Development and Brain Activity. R.D. Morris, L. Lazarus-Benbenisty, N. Krawiecki, M. Wolf, Naming Abilities in Children With Brain Tumors. M.A. Romski, R.A. Sevcik, Patterns of Language Development Through Augmented Means in Youth With Mental Retardation. V.W. Berninger, R.D. Abbott, Modeling Developmental and Individual Variability in Reading and Writing Acquisition: A Developmental Neuropsychological Perspective. M.W. Lovett, R.W. Barron, The Search for Individual and Subtype Differences in Reading Disabled Children's Response to Remediation.